Uwe Rosler, Neil Redfearn, Brian McDermott, even Steve Evans, they all may feel under-appreciated. Certainly they will feel they don’t get the credit they deserve and nobody really notices the countless hours of hard work they have put in to Leeds United. But then that’s the nature of football; a cut-throat business, particularly so at Leeds United, of course. In other walks of life we probably all have our own stories about our best work perhaps being ignored or not being given due credit. Be it at home, at work or on the five-a-side pitch with your mates, it’s always nice to get a slice of the glory. Save a thought then for local artist Leyla Murr, creator of the elegant and refined floor mosaic in the refurbished Old Peacock. Yes, that’s it, the one that thousands of you walk all over and probably never notice on a match day, but when the pub is a little quieter it is a feature that radiates the homely, yet polished and sophisticated feel that is the very essence of what Ossett Brewery wanted to create at this most special of football pubs. Leyla’s creation is the centrepiece that effortlessly complements the yellow and white floor tiles and the understated Leeds United styling in and around the pub, but essentially it displays with due reverence, the famous Peacock motif, and as such is perhaps the central feature of the 2013 refurbishment of the pub. A mutual friend working in the pub introduced Leyla to joint managing director Jamie Lawson when the idea of a dominant artistic feature was first discussed. “I am a full-time artist and paint mostly in my studio,” explains Leyla “so when Jamie asked me to do a mosaic I was very excited about doing something different.” The mosaic is based on Ossett Brewery’s re-designed but hugely popular Peacock motif, also showcased in stained glass above the back door. In a painstaking process involving a level of patience that most of us couldn’t imagine, the mosaic took 45 hours altogether to complete, using around 8,000 tiled pieces. With the wholesale refurbishment at the pub almost complete, Leyla’s hotly-anticipated creation was one of the final pieces to be put into place, with the precise nature of the creation bearing witness to the eye for detail involved in all areas of the pub’s new look. The words ‘proud as a peacock’ have something of a double meaning in the case of Leyla’s spectacular creation. The completed mosaic sensationally fulfilled the brief in projecting the dignity and honour of the famous peacock image, but on the flipside, there was no tolerance for the mosaic to stand proud of the floor surface. Leyla’s precise measurements ensured her artwork sat flush on the floor with no danger of the hordes of Leeds fans shuffling through on a match day tripping over a protruding edge, or sadly, even knowing it was there. Names from the past perhaps, but Leyla’s floor mosaic is an enduring piece of art that should outlive many Leeds United stars of the present and the future. So next time you are in the pub take a close look at it, nobody will bat an eyelid if you are on your hands and knees bowing down to the peacock! Of course we enter November with another head coach in the extremely hot seat at Elland Road. Welcome to Steve Evans and good luck in what has somehow become one of the most difficult jobs in football. Football doesn’t pose us too many problems at the Old Peacock; it’s a pretty simple concept. When Leeds United are at home we are open and welcoming as many Leeds fans as we can through our doors. It makes it a bit more difficult for everyone when these games are midweek, and after October’s Thursday night oddity, we have another midweek game very quickly in November. Cardiff are the visitors to Elland Road on Tuesday the 3rd, before two Yorkshire derbies at Huddersfield and then back here on the 21st for the visit of Rotherham United and the return of Neil Redfearn. In between those games is another frequent irritation of the modern game; the international break, where we are left kicking our heels and dreaming up ways to avoid shopping at B&Q. Be assured we will be open at the Old Peacock if you need some respite and a substitute for your pre-match fix. 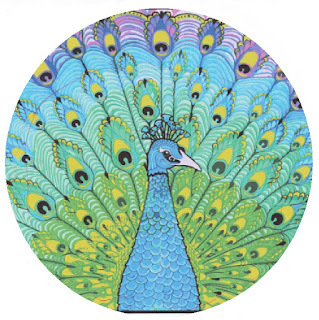 We are not far from the mad Christmas period now, so if you haven’t got your plans sorted for family, work or celebrations with friends, let the Old Peacock look after all the hassle for you. We have two menus for Christmas parties in the lead up the 25th and for the big day itself. Places are being booked up fast so contact the pub direct on oldpeacock@ossett-brewery.co.uk or by phone on 0113 2715962 to secure your place. In the meantime, come and visit us for lunch or dinner when our fantastic menus are on offer six days a week. Finally, for special competitions, announcements and promotions follow us on Twitter and Facebook where all the latest information is posted. What happened to August? What happened to summer? A whirlwind of two home games at Elland Road, the end of the transfer window, Leeds Rhinos winning the Challenge Cup and before you know it September is upon us, and it’s chilly mornings, nights drawing in and arguments about putting the heating on. 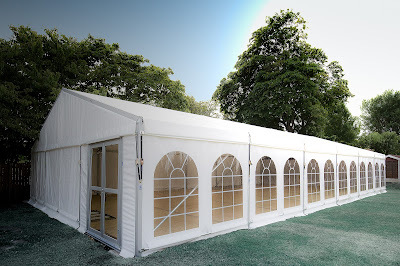 Last month saw us launch our new match day marquee in the Old Peacock beer garden and it proved to be a massive success. We managed to entertain and lubricate capacity crowds in the pub for both home games against Burnley and Sheffield Wednesday, and while there may have been two score draws on the pitch, it was two home wins for the Old Peacock punters. The weather was pretty kind to us and despite the lunch time kick offs for both games, Leeds fans proved they have an insatiable thirst whatever time of the day it is. Thanks for all those who came along and supplied pics and videos of the crowds in the beer garden and marquee. We hope you agree that the marquee has added a new dimension to the legendary Peacock match day experience, and allows you all to get served much quicker and spend more time building up that special pre-match atmosphere. September has arrived with a further two home games for Leeds United, this time in quick succession. This coming weekend we have our first 3pm kick-off of the season when Brentford come to visit, followed by our first midweek game against Ipswich Town on Tuesday 15th. 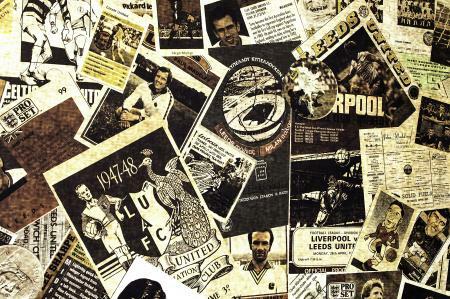 Every football fan prefers a 3pm Saturday afternoon kick-off - it is what generations of football culture was built upon - and there are precious few for Leeds fans in particular, thanks mainly to Sky Sports. A 3pm kick-off allows you to do something worthwhile in the morning, definitions of which will vary wildly depending on your age, relationship status and Friday night antics. But you will maybe have a bit of lunch and still have time to get down to the Old Peacock for plenty of pre-match frolics. This is far more relaxing than dragging yourself out of bed, eating when you don’t necessarily want to and rushing down for a lunchtime kick-off, where everybody looks ill and miserable and would rather be feet up on the sofa and hence, the atmosphere within the ground is never the same. And that’s just for home games. Sky Sports; disturbing the football fan’s body clock since 1992. Away from football, there is something unique and very special that we are looking forward to at the Old Peacock in September; the Rugby World Cup, with two games being played at Elland Road towards the end of the month, and every game live on our big screens. Leeds has been chosen as a host city with Millennium Square staging the 'FanZone' throughout the tournament, which more than likely will be a pretty lively place during the six-week long extravaganza. But the weekend of 26th and 27th of September will see Rugby Union fans from various corners of the globe converge on Elland Road to taste some of the rugby heritage of Leeds, and most importantly, the hospitable match day experience of the Old Peacock. Rugby was played on Elland Road long before football was on a regular basis, when Holbeck Rugby Club were residents between 1897 and 1904, prior to Leeds City’s formation. This was Rugby League of course, as the split of League and Union codes had occurred shortly before in 1895. Rugby Union has only actually been played once before at Elland Road, this was a friendly between England North and South Africa in November 1992. 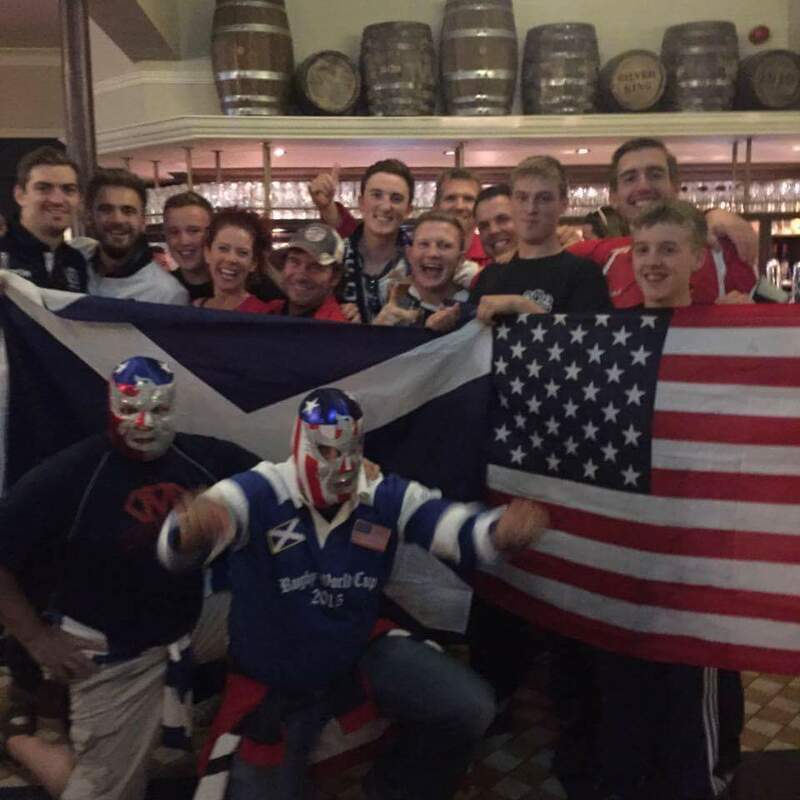 But Saturday 26th September sees Rugby Union return with the world watching, as Italy play Canada in Pool D, while Sunday 27th has more of a local flavour with Scotland facing the USA in Pool B. Both games have a 2.30pm kick off and while Rugby Union has plenty of differences to football, one thing that unites fans of both, and particularly Leeds United fans, is a raging thirst on match day, so we are getting ready for a busy double-header of a weekend. Throughout the tournament we will have the Greene King IPA Inflatable in the Old Peacock beer garden, to entertain fans seeking that unique photo opportunity pre and post-match. We expect the inflatable rugby posts and crash mat will be hard to resist even before fans have had a beer, so it is likely that dignity will be in short supply as kick-off approaches. But attempt a try-scoring swallow dive, share your photo and you may win some prizes. Getting back to football, and we think it’s been a pretty good start to the season for Leeds United, with head coach Uwe Rösler appearing to get his ideas across and instilling the kind of organisation into the team that we expected he would bring. It’s taking a bit of time for the side to look really dangerous in an attacking sense but that will come, particularly with some of the signings made beginning to bed themselves in. Meanwhile, we have seen goals, and some of them have been absolute crackers. The scenes in the pub when Chris Wood launched his 20-yard rocket into the net at Derby for the 88th-minute winner showed what a crucial victory it was, and hopefully there will be plenty more of that to come. Before I go, just a quick word about Archies, the new bar opened by Ossett Brewery in Granary Wharf this month. Archies is open all day for breakfast through to dinner, and even for cutting a rug late into the night. 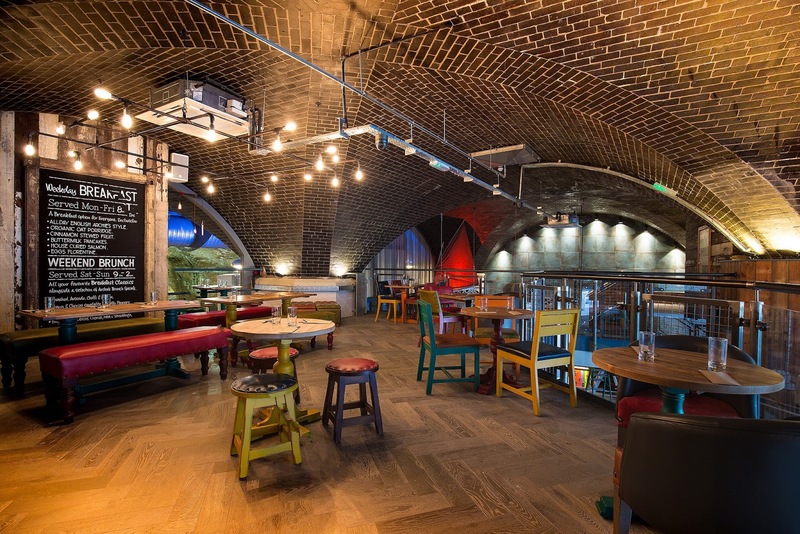 There is definitely a merrymaking vibe to the latest venture, which joins The Hop and Candlebar to form a little something for all tastes along the scenic Leeds waterfront, and even a variable pub crawl for those of you who can handle a little slice of everything. Hope to see you in the Old Peacock during September. 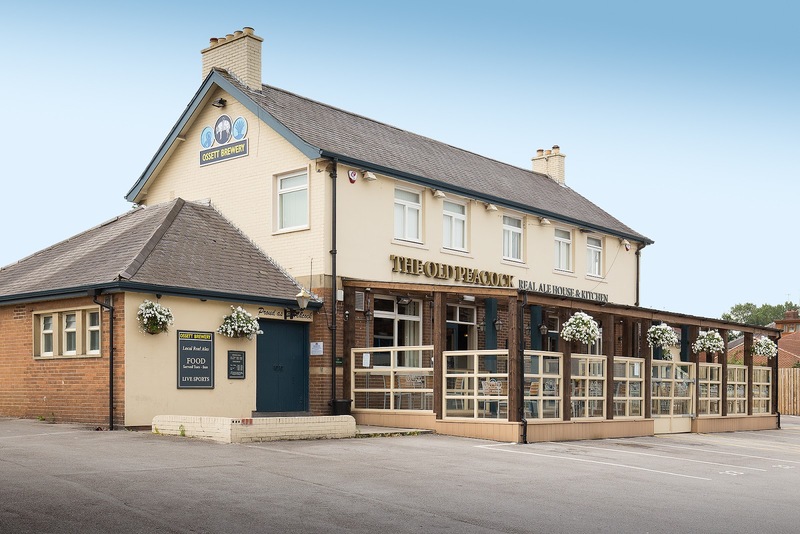 Don’t forget we have our normal food menus and quiz nights in operation in between home games and you can keep up-to-date with what’s going on via our new and improved social media channels on Twitter, Facebook and Instagram. Football is back and it’s time to steady ourselves for nine months of ritual chaos, joy and agony as we navigate another unstable voyage on the good ship Leeds United. Welcome to my first official blog post for The Old Peacock; that bastion of refuge, inspiration and consolation for generations of match-going Leeds United fans. I’ve been spending match days in the Old Peacock for over twenty years, pretty much since I was old enough to make watching Leeds United more pleasurable and bearable, via a few pints. 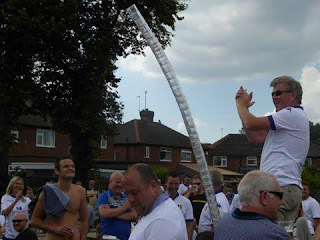 The role of the match day pub has grown increasingly significant as Leeds United have put us through the ringer in recent years, and undoubtedly now it is a pretty much essential part of the 23-times-a-season experience. Home; a place of comfort and belonging. Suffice to say, all the hardy souls that enter the Old Peacock on a match day are following in the footsteps of literally every generation of Leeds United fans. The Peacock has stood on Elland Road since 1826 – 93 years before Leeds United even existed - and is perhaps, therefore, as much in the very fabric of the club as anything else; be it a player, manager, owner or fan. Which is why Ossett Brewery are so dedicated to maintaining the success and prosperity of what is an institution to Leeds United fans; the embittered, often-forgotten but unflinchingly loyal body of people that breath life into the football club. To solidify that commitment, the management of the Old Peacock have not sat idly by as they count the proceeds of a guaranteed packed-out pub for every home game. They have invested this summer in making the match day experience far more comfortable for the legions of fans that walk through their doors. This season Old Peacock regulars will see a new marquee in the beer garden with a full bar and the addition of four attentive staff. Capacity of the pub’s entire site on a match day is 1100 people, and the marquee won’t change that. What it will change is to ensure that those 1100 people can get served quicker and easier and can then relax in more spacious surroundings. 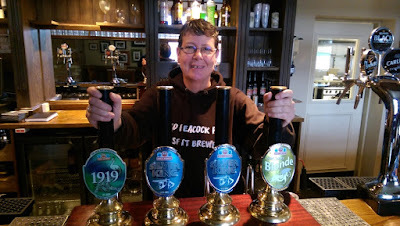 Other than that, Ossett are sticking to a winning formula; 1919, Yorkshire Blonde and Silver King, the full range of lagers, ciders, wines, spirits and soft drinks as before, and the hearty goodness of the ‘Match Day Menu’ fresh from the kitchen. August looks to be an enticing introduction in terms of Elland Road home games, with two meaty ones on the agenda. This coming Saturday (8th) sees newly-relegated Burnley as the season’s first visitors before Sheffield Wednesday (22nd) arrive for a Yorkshire Derby fixture. Both games are scheduled for a lunch time kick-off and are live on Sky Sports, factors which routinely affect the attendance and atmosphere. But early-season optimism is rife and if Uwe Rosler’s promise of ‘heavy metal football’ offers us one thing, it is that a few beers pre and post match sound like the perfect accoutrement. 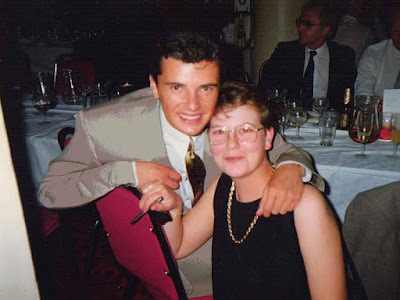 I’ve a feeling that life will not be dull under Rosler, and a gung-ho approach and talk of instilling a ‘top six mentality’ offer reminders of better times, and I’ll certainly raise a glass or five to that. Life at the Old Peacock goes on between home games of course, and the range of menus remain in place during the week as usual. 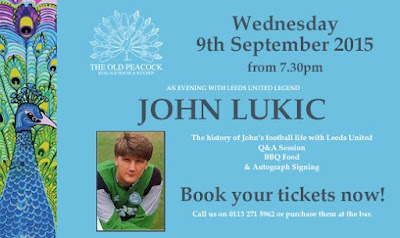 Following the success of the recent Norman Hunter and Duncan McKenzie nights, early September sees league title-winning goalkeeper John Lukic make a rare appearance (Wednesday 9th September at 7.30pm) for a Q&A session and autographs. Lukic is a veteran of 431 games for Leeds and is member of an exclusive club, not just for winning a championship medal, or for having two spells at both Arsenal and Leeds, but also for skilfully maintaining the same hairstyle for over forty years. Come along in September to see if he still has it, hear some unique stories and meet a title-winner into the bargain. All the best for now, enjoy the two home games in August and follow us on Twitter @oldpeacockleeds for news on what’s happening at the pub, match day competitions and plenty of photos, videos and posts on the history behind what makes the Old Peacock unique to Leeds United.